Today is May the 4th….Star Wars Day. Get it? May the ‘fourth’ be with you! I fell in love with crazy little BB8 in The Force Awakens. At first I was annoyed he just kept running amuck – but after a while I kinda liked his zooming style. It was kind of playful! So today I decided to let him really play…with paint. Watch the video below or click HERE to see it in HD on YouTube. That was fan-tastic! I think BB8 is so cute and you make it seem like he’s having fun. 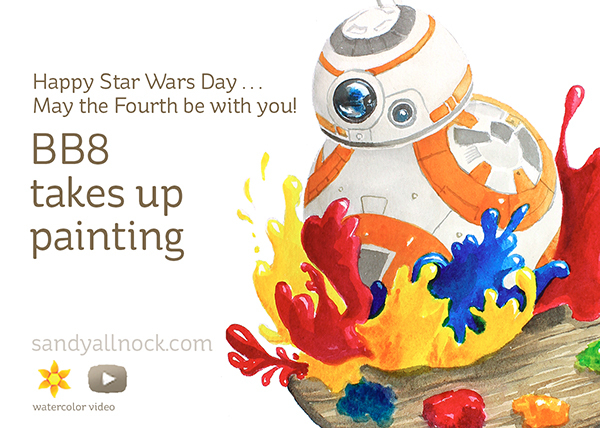 I recently made a BB8 birthday card for my nephew so I recognize all the stripes and widgets that you so painstakingly painted in. Fabulous! its my birthday and i love star wars so this was just a perfect post for me today. adorable! What a TREAT to watch you color this….thanks for sharing!!!! I think it’s so awesome that you are celebrating Star Wars day!! I love how playful your BB-8 is and how much motion he has. Another beautiful, fun painting!! So much fun! Love the brights. Reminds me I haven’t seen the movie yet. I must be hiding under a rock. I love this painting. May the force be with you too! And may the Fourth be with you as well, Obi Wan.